If you are interested in this book, a free Open Access version is currently available to download on the UCL Press website. Suburban Urbanities: Suburbs and the Life of the High Street. Laura Vaughan (ed.). UCL Press. 2015. Book reviews rarely comment on the quality of the production of the physical item itself, yet Suburban Urbanities: Suburbs and the Life of the High Street begs an initial reflection on this aspect. UCL Press should be commended for producing a book that looks and feels beautiful: it is a physical item that any scholar interested in the urban should want on their shelf, and there is something to be said for the importance of this. Of course, such attention to detail would be wasted without good content, but thankfully this collection, edited by Laura Vaughan, does not disappoint. It is peculiar that the importance of the suburb has received surprisingly scant attention from urban scholars, who have instead tended to focus on either the industrial metropolis or the rural. Those familiar with the work of scholars such as Mark Clapson will know that there are many reasons for this not to be the case. 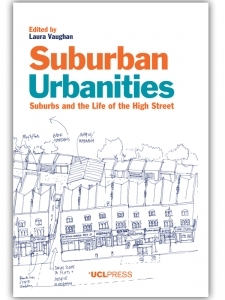 Vaughan’s contribution to the expanding field of suburban studies further highlights the folly of such neglect, and emphasises the attention that the suburb as a focus of study merits. The contributors come from reasonably interdisciplinary backgrounds, and the benefits of such an eclectic approach are reflected in a work which manages to examine the importance of the suburb through a wide academic lens. With that said, architecture and urban design are the predominating influences, and from a personal perspective it would have been nice to see the input of a historian (although the book undoubtedly takes note of, and is influenced by, historians as well). In many ways this is less of a criticism of Vaughan, and more a comment on the multifaceted academic interest this work should engender. Historians, sociologists, geographers and others who share an interest in the urban (or suburban) can find food for thought in this collection. Vaughan’s work demonstrates the fruits such collaborative approaches can potentially yield, and hopefully will encourage future works along these lines. ‘Rather than taking the city out of the suburb or the suburb out of the city’, the aim of Suburban Urbanities, in Vaughan’s own words, is ‘to consider the two together: the suburb as a continuum of the city’s spatial-social complexity. It is therefore intended to make the case for the suburbs’ (however defined) urbanity.’ To do this, the book is split into four parts: a). ‘Theoretical Preliminaries’; b). ‘Suburban Centralities’; c). ‘High Street Diversity’; and d). ‘Everyday Sociability’. Without going into the detail that each section individually merits, it is worth briefly charting what the book appears to be trying to do through this structure. In her introduction to the book, Vaughan makes the case for the suburb in historical perspective, arguing that ‘suburbs are as old as the city itself’. The distinction is an important one as through it Vaughan makes the case that we need to consider the suburb as part of the city rather than aside from it. There is much to support such a contention, particularly given that – as she notes – terms and their meanings change over time: the 1933 vision of the suburb as a ‘kind of scum churning against the walls of the city’ stands in stark contrast to the visions of the late-nineteenth- and early-twentieth-century housing reformers. Given these shifting understandings of the term ‘suburb’, in the first section of the book Vaughan is joined by Sam Griffiths and Muki Haklay, together doing an admirable job of working towards a theoretical understanding of what we mean by the word itself. The second ‘theoretical preliminary’ chapter then places the emphasis more squarely on the high street – a central theme of the book – and argues that the suburban high street is a ‘morphological event’. The authors’ claim is that the high street requires serious conceptualisation as a distinctive mode of social time-space organisation that in many cases emerged historically and in relation to persistent morphological structures that often pre-date the built environment itself. Such focus on the performative aspect of the high street is important in particular for our understandings of community, and the ways in which spaces and their functions can evolve over time; this section is certainly one of the strongest in the book. The second section, ‘Suburban Centralities’, seeks to locate these understandings in a wider context. The reader is transported through varying chapters on places ranging from Limassol to London, to Toledo and Tripoli, in an impressively international investigation. These examples demonstrate the way in which local places are shaped over time, and how the growing city can (or cannot) be seen to influence the ability of the local to adapt to the social and economic transformations such growth and change has engendered. After this second section, the book pleasantly alters scope to examine the primacy of the high street. Garyfalia Palaiologou’s chapter demonstrates the way in which Islington has changed from being regarded as a suburb to its position today as part of urban London. Such attention to the historical development of the suburb provides a compelling argument in itself, as well as a strong reaffirmation of the initial contentions outlined in Vaughan’s introduction. This is complimented further by the final section, ‘Everyday Sociability’, which examines people. This ensures that the reader remembers that whilst it is potentially easy to concentrate on places, it is important to be mindful of the agency of people located within those spaces, and to examine the mutually informing and reciprocal nature of their relationship. The final section does this admirably by exploring the ways in which the suburbs shaped, and have been shaped by, those who inhabit those spaces through theoretical and empirical analysis of the design and layout of public spaces, as well as through ethnographic perspectives of everyday life in the suburb. One important underlying theme, which underpins many contributions throughout, is the crucial understanding that suburbs are not less. There has been an assumption, especially historically, that the suburb as a unit of investigation is somehow less worthy of attention, as if life in the suburbs was somehow less rich than in the cities they orbited. Vaughan would perhaps argue that such a distinction between the two was folly in itself. Yet regardless of how we choose to define the suburb, what Suburban Urbanities demonstrates is that the burgeoning field of suburban studies must surely grow, and with it we can hope for a similar expansion to our understandings of this fascinating and oft-neglected aspect of urban studies. This collection can only serve to help that cause by illustrating the rewards that such investigations can offer. Calum W. White is an AHRC D.Phil in History Candidate and the Peter Storey Scholar at Balliol College, University of Oxford. His current research explores social housing policy in Britain during and after the First World War. You can find him on Twitter at @CalumWWhite. Read more reviews by Calum W. White.